Enviar solicitação de disponibilidade com as datas desejadas para The Betsy – South Beach. Our warm and inviting Classic King Room is the perfect place to unwind after a day at the beach. It measures 250-275 square feet and features 1 King bed accommodating up to two guests. Limited view. Each room features hardwood floors, marble baths with spacious walk-in glass enclosed showers and bath mirrors with built-in LCD TVs. Amenities include Malin+Goetz luxury bath products, creative private bar offerings, high-speed wireless internet and curated guest libraries. Our Classic Double provides a welcoming, tropical retreat. Light and airy interiors offer 250 square feet of space with two double beds accommodating up to four people. Each room features hardwood floors, marble baths with spacious walk-in glass enclosed showers and bath mirrors with built-in LCD TVs. Amenities include Malin+Goetz luxury bath products, creative private bar offerings, high-speed wireless internet and curated guest libraries. Our Superior King Room is a tranquil refuge overlooking our idyllic Atrium and Courtyard Pool. Thoughtfully appointed interiors offer an average of 250-275 square feet of space with one king bed accommodating up to two guests. Each room features hardwood floors, marble baths with spacious walk-in glass enclosed showers and bath mirrors with built-in LCD TVs. Amenities include Malin+Goetz luxury bath products, creative private bar offerings, high-speed wireless internet and curated guest libraries. Located in the Art Deco Wing and complete with a balcony, the Superior Balcony Room offers an average of 245 square feet of refined comfort with one king or queen bed accommodating up to two guests. Limited or Atrium view. Each room features hardwood floors, marble baths with spacious walk-in glass enclosed showers and bath mirrors with built-in LCD TVs. Amenities include Malin+Goetz luxury bath products, creative private bar offerings, high-speed wireless internet and curated guest libraries. Overlooking our intimate courtyard pool, our Superior Pool View Double offers 250 square feet of elegant space with two double beds accommodating up to four people. Each room features hardwood floors, marble baths with spacious walk-in glass enclosed showers and bath mirrors with built-in LCD TVs. Amenities include Malin+Goetz luxury bath products, creative private bar offerings, high-speed wireless internet and curated guest libraries. Our Classic Suite King wraps our guests in sensory detail. Complete with a separate living and entertaining area, it offers 400-550 square feet of space with 1 King bed and 1 sofa bed accommodating up to four people. Each room features hardwood floors, marble baths with spacious walk-in glass enclosed showers and bath mirrors with built-in LCD TVs. Amenities include Malin+Goetz luxury bath products, creative private bar offerings, high-speed wireless internet and curated guest libraries. Spacious, bright and outfitted with a terrace overlooking our Atrium, our Deluxe King Balcony Room offers 350 square feet of serene space and easy access to our rooftop swimming pool. Each room features hardwood floors, marble baths with spacious walk-in glass enclosed showers and bath mirrors with built-in LCD TVs. Amenities include Malin+Goetz luxury bath products, creative private bar offerings, high-speed wireless internet and curated guest libraries. Our Deluxe Ocean View King is an elegant, sunlit room facing Lummus Park and the Atlantic featuring rich custom furnishings, 250 square feet of space and one king bed accommodating up to two people. Each room features hardwood floors, marble baths with spacious walk-in glass enclosed showers and bath mirrors with built-in LCD TVs. Amenities include Malin+Goetz luxury bath products, creative private bar offerings, high-speed wireless internet and curated guest libraries. Ideal for families, our Classic Suite Double offers 550 square feet of relaxed elegance with two double beds and a sofa bed accommodating up to four people. The separate living and enteraining area provides ample space to relax, refresh, and renew. Each room features hardwood floors, marble baths with spacious walk-in glass enclosed showers and bath mirrors with built-in LCD TVs. Amenities include Malin+Goetz luxury bath products, creative private bar offerings, high-speed wireless internet and curated guest libraries. Our Superior Pool View King provides a tranquil refuge overlooking our intimate courtyard pool complete with a separate living and entertaining area. Thoughtfully appointed interiors offer 550 square feet of space with one kind bed and a sofa bed accommodating up to four people. Each room features hardwood floors, marble baths with spacious walk-in glass enclosed showers and bath mirrors with built-in LCD TVs. Amenities include Malin+Goetz luxury bath products, creative private bar offerings, high-speed wireless internet and curated guest libraries. 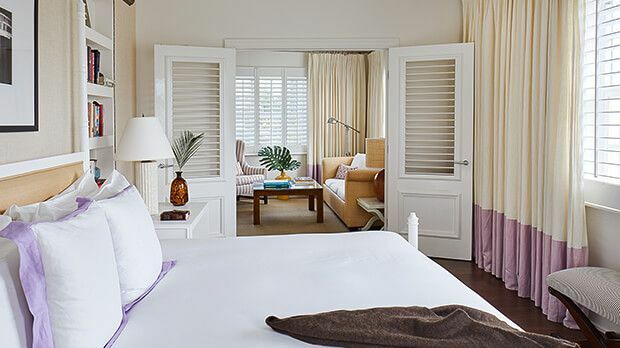 Outfitted with two double beds accommodating up to four people, our Deluxe Ocean View Double offers a tropical retreat with 250 square feet of space and a view of Lummus Park and the Ocean to match. Each room features hardwood floors, marble baths with spacious walk-in glass enclosed showers and bath mirrors with built-in LCD TVs. Amenities include Malin+Goetz luxury bath products, creative private bar offerings, high-speed wireless internet and curated guest libraries. Located in the Art Deco Wing, our Superior Double Balcony Suite provides 510-655 square feet of sophisticated indoor and outdoor entertainment space. This suite features balconies from each the living area and bedroom area featuring Atrium and city views. Outfitted with one king bed, one sofabed and tasteful interiors, this suite can accommodate up to four guests. Each room features hardwood floors, marble baths with spacious walk-in glass enclosed showers and bath mirrors with built-in LCD TVs. Amenities include Malin+Goetz luxury bath products, creative private bar offerings, high-speed wireless internet and curated guest libraries. Our Royal Suite Ocean View King provides 650 square feet of luxurious living and entertainment space overlooking Lummus Park and the Atlantic Ocean. Elegant, colonial design and airy interiors offer a tropical retreat with one king bed and a sofa bed accommodating up to four people. Each room features hardwood floors, an oversized marble bathroom with double sinks and a spacious walk-in glass enclosed shower and bath mirror with built-in LCD TVs. Amenities include Malin+Goetz luxury bath products, creative private bar offerings, high-speed wireless internet and curated guest libraries. Located atop our Art Deco Wing, this suite provides an oversized wrap-around terrace that is accessible from the living area or the bedroom to enjoy plenty of ocean breezes. Elegant decor and inspired design, make this 625 square foot Skyline Level Bungalow Suite the perfect haven for a relaxed South Beach getaway. This suite features one king bed and a queen size sofa bed accommodating up to four guests. The Skyline Level Bungalow Suite features hardwood floors, marble baths with spacious walk-in glass enclosed showers and bath mirrors with built-in LCD TVs. Amenities include Malin+Goetz luxury bath products, creative private bar offerings, high-speed wireless internet and curated guest libraries. Located in the Art Deco Wing, our loft-style Skyline Penthouse wraps our guests in pure luxury complete with its own baby grand piano. 905 square feet of well-appointed living and entertainment space featuring a kitchenette, a spacious wrap-around terrace with stunning Atrium and city views and a king size bed provide a refined haven for our most discerning guests in the heart of South Beach. Our Skyline Penthouse features hardwood floors, an oversized marble bathroom with double sinks and a spacious walk-in glass enclosed shower and bath mirror with built-in LCD TVs. Amenities include Malin+Goetz luxury bath products, creative private bar offerings, high-speed wireless internet and curated guest libraries.